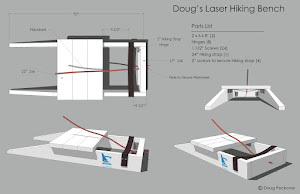 The Laser Master Midwinters East is being hosted at Charlotte Harbor in Florida. This is a beautiful spot that has some really good weather for those who are unable to sail in the winter. We're sailing in a protected bay that feels more like a lake than open water. Here's the first day's report. Race 1: the wind was coming from the east about 8-12 with typical offshore shifts. The line was long with the pin favored. Being far from race hardened, I decided to start 2/3 of the way down the line so the experts could fight it out at the pin. This was my first race in 10 weeks and I felt rusty. The fleet got away going left. Peter Shope won the pin, tacked, and crossed the fleet. I wanted to tack but could not. In fact, the boat on my hip almost rolled me before he tacked away. I followed with the 4 leaders on port below and ahead. After a few minutes, they tacked on a header and crossed just in front of me. I had the feeling that the right would pay so kept going right on port. When near the layline, tacked in good pressure, having moved up into 2nd. And then it happened - the dreaded 20 degree header all the way into the mark. Ouch. Was really fortunate to round 8th. On the run, there were about 10 boats right behind me so decided to jibe to get in clear air. But the left (looking downwind) had less pressure and I lost to those behind me, rounding the left gate in the mid teens. Having committed to the right side (looking upwind) went hard right in good pressure. Rounded 7th just behind Andy Roy. The 6 boats just ahead were lined up side-by-side. Buzzy Heausler and Peter Shope somehow got more pressure and finished 1, 2. James Liebl (former Master Radial World Champ) finished 3, while I passed Andy to finish 6th. Lots of rust but this was an OK race. The wind was dying as the sea breeze tried to fill in, so I switched to my light-air mainsheet and took off my hiking pants. Race 2: the pin was even more favored and crowded. Decided to start 100 feet from it and tacked on the gun. And was launched, in pressure, and in phase... when they called for a late general recall. Darn!!! The next start was under a black flag and Andy Roy tried something I have always wanted to try - a port tack start in the middle of the line taking advantage of the lag with the black flag. In fact, because of the way the wind bends around all of the sails, Andy was actually sailing on a lift on port tack. On the gun, Andy hardened up and I tacked. We were about 50 feet apart on port and almost immediately I got a big inside lift. Two minutes later, I tacked on a header and crossed the fleet while Andy was deep. Watched one of the leaders sitting on the deck moving really fast... from rocking, Told him to cool it which he did. John MacCausland and one other had great speed and passed me before the mark. And then the wind died. At the bottom mark, what little wind we had shifted further west and the race was abandoned, so we headed in. Had been in 4th position. But there's more! After a very long sail back to the club, I put my Laser on the dolly while still in the water and then went to get my shoes. When I came back, I noticed the plug was not in. So, someone is messing with me or I'm a dumbass for sailing the entire day without plug. Wait, no, we have to be positive. So, some kind person helped me by taking my plug out... or I sailed the entire day brilliantly without a plug, with my weight so far forward that I only took on a few quarts of water. I think I prefer this second version. Sounds like the first race was a good warmup for you. 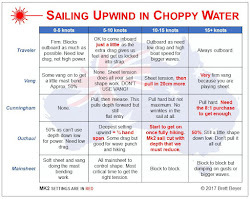 Curious about Andy's port start - from your comment about the wind bending around the sails, it sounds like he was on port tack behind most of the starboard tackers and found a hole. Is that what happened? It's better than that. The wind starts to bend to windward of the fleet, so Andy was sailing with the end of his boom almost hitting several dozen masts. People were yelling to watch out but he knew exactly what he was doing. Very cool! Wow, that really is cool - and ballsy. Good for him. Why does the wind bend to windward of the fleet? 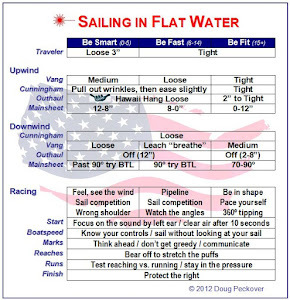 How do the air molecules upwind "know" that there is a sail to leeward of them? Good question. Try this: on a windy day, stand 2' in front of a tall fence facing the wind. Many people are surprised to learn that it's calm. This is because the wind "knows" what's behind you. In this case, the wind has to go up and starts this in front of you. It's the same on a starting line with boats lined up. The wind "knows" that it's about to go around the sails and starts this in front of the fleet. So the entire fleet is actually starting on a knock. This is why it's so important to get your bow out on the starting line. Your're not only getting clear air, your no longer sailing on a knock. As they say, the rich get richer. Hmmm. I guess I don't understand wind. That might explain a lot!